Fix: DetectLanguage() Failure. Exiting (Corel PaintShop Photo Pro X3 (PSP X3)) - TACKtech Corp. 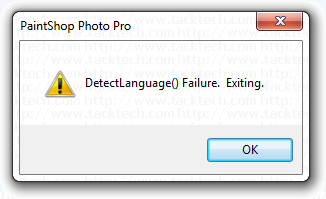 Problem: When opening Corel PaintShop Photo Pro X3 you receive an error dialog stating DetectLanguage() Failure. Exiting. This bug has been duplicated on both the 32-bit and 64-bit editions of Windows 7. Solution: Add the Lang registry string to the registry as described below. Create a new REG_SZ Value named Lang. Set the Value to the appropriate Language Code. Example: For English use the value EN. REGEDIT4 [HKEY_LOCAL_MACHINE\SOFTWARE\Corel\Paint Shop Pro\13\Installer] "Lang"="EN" "InstallDirectory"="C:\\Program Files\\Corel\\Corel PaintShop Photo Pro\\X3\\PSPClassic\\" "Language"="English" "Directory"="C:\\Program Files\\Corel\\Corel PaintShop Photo Pro\\X3\\PSPClassic\\" "RCPath"="C:\\Program Files\\Corel\\Corel PaintShop Photo Pro\\X3\\PSPClassic\\" "ProductName"="Corel PaintShop Photo Pro X3" "InstalledLanguages"="10:EN:1033:IE:2057:DE:1031:ES:1034:FR:1036:IT:1040:NL:1043:JP:1041:PL:1045:CT:1028" "Brand"="Corel" "ProductLanguage"="10"
REGEDIT4 [HKEY_LOCAL_MACHINE\SOFTWARE\Wow6432Node\Corel\Paint Shop Pro\13\Installer] "Lang"="EN" "InstallDirectory"="C:\\Program Files (x86)\\Corel\\Corel PaintShop Photo Pro\\X3\\PSPClassic\\" "Language"="English" "Directory"="C:\\Program Files (x86)\\Corel\\Corel PaintShop Photo Pro\\X3\\PSPClassic\\" "RCPath"="C:\\Program Files (x86)\\Corel\\Corel PaintShop Photo Pro\\X3\\PSPClassic\\" "ProductName"="Corel PaintShop Photo Pro X3" "InstalledLanguages"="10:EN:1033:IE:2057:DE:1031:ES:1034:FR:1036:IT:1040:NL:1043:JP:1041:PL:1045:CT:1028" "Brand"="Corel" "ProductLanguage"="10"